Einstein's Oilery is a homegrown, Idaho company founded right here in the Treasure Valley. The first Einstein’s location opened in 2007 on Fairview Avenue in Meridian. Since then, our team has worked tirelessly to expand to 8 locations in Boise, Meridian, Garden City, Nampa, and Caldwell. Because of our local roots, we will always be deeply committed to and grateful for this community. It has truly made us what we are! 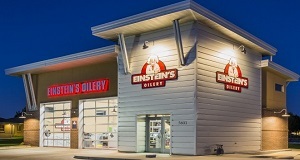 Einstein's Oilery was founded by Michael Meuret and Stephen Taylor, who met while employed by a chain of 5 franchised automotive maintenance centers which they managed together. During their tenure they became frustrated with the limited opportunities afforded them within the franchise structure and dreamed of one day launching a business of their own. They envisioned a company that would revolutionize the automotive oil change industry which is often characterized by dingy facilities, dishonest practices, and mediocre service. They aimed to accomplish this by providing a customer experience that was unparalleled and truly extraordinary. To embody this brand to be, they chose Albert Einstein, the very antithesis of the status quo; an extraordinary individual who lived on the cutting edge and staunchly resisted anything ordinary or boring. Einstein's Oilery was born. At Einstein's Oilery we believe changing your oil should be enjoyable rather than a chore and that you should always leave with the utmost confidence that the job was done right. To that end, we invite you to relax in your car and watch our technicians at work on TV monitors mounted next to your vehicle. You can also enjoy a free beverage of your choice and a newspaper or surf the web on one of our complimentary in service tablets. You never need an appointment and you'll be in and out before you know it. Plus, we only use products of the highest quality so that every Einstein's service meets or exceeds your vehicle's warranty requirements. We are deeply committed to improving the lives of our employees both personally and professionally. That’s why in addition to offering industry leading pay, benefits, and advancement opportunities; Einstein’s Oilery dedicates 10% of all profits to our employees and their families through an annual profit sharing bonus. The Einstein's team is passionate about investing in our neighborhoods and beyond. That’s why we donate at least 20% of all profits to charitable organizations throughout the Treasure Valley and around the world. Some of our favorite causes include local schools, St Jude Children’s Research Hospital, local food banks, youth sports programs, and orphan care in Africa and India. At Einstein’s Oilery your oil change helps change the world!